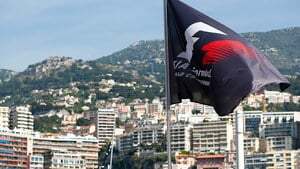 Formula One's glitzy track in Monaco cannot always provide great racing, and this year it delivered on the promise with mostly processional but occasionally baffling action that say an intriguing result, a safety car period, a handful of accidents, and some great points finishes. Although we lacked overtaking opportunities, there was a lot of tension around the strategy and things looked close as the finish line approached. If you missed any of the action or want a quick reminder of who pitted when, then read on, as the Factbyte Factbox replay should have everything you need. Sebastian Vettel wins a Ferrari 1-2, with Ricciardo on the podium. Bottas finishes fourth, with Hamilton clawing back seventh for a points finish. Button and Wehrlein collide, tipping the Sauber onto its side ahead of the tunnel. Hülkenberg, Ericsson, Vandoorne, Kvyat and Stroll all also retire. Double points finish for the Haas team. Hello F1 friends, welcome to the Monaco Grand Prix weekend. It's sunny, it's beautiful, there are boats, what more can you ask? It's been an exciting weekend already, with lots happening in qualifying, but let's start at the beginning with some info about where we are going racing today. Kimi Räikkönen starts the race from pole position after a superb qualifying from Ferrari. Both red cars will be on the front row of the grid, with Bottas and Verstappen lining up behind them. Lewis Hamilton had a torrid time during the qualifying session yesterday, not at all happy with the car and then missing out on his final flying lap due to yellow flags. There have been a lot of lockups, and brushes with the barriers, and drivers running wide, and Stroll's crashing into the walls already, and I'd expect that to continue today. Jenson Button is back for his one-off special weekend, but unfortunately he has to start from the pit lane. His McLaren was already suffering a 15 place grid drop due to power unit tweaks, and the team then modified the car under parc fermé conditions. It was looking better for McLaren in qualifying, with both cars into the top ten for the first time this season. Unfortunately, Vandoorne crashed into the wall at the end of Q2, so couldn't participate in that top ten shoot-out. He also takes a three place grid drop from an incident in Spain. Hamilton starts from 13th on the grid, next to Vandoorne and directly behind Kevin Magnussen. As Monaco is so narrow, there's a lot of focus on strategy rather than out and out power, so those who are down on power unit performance may find themselves doing better this weekend. 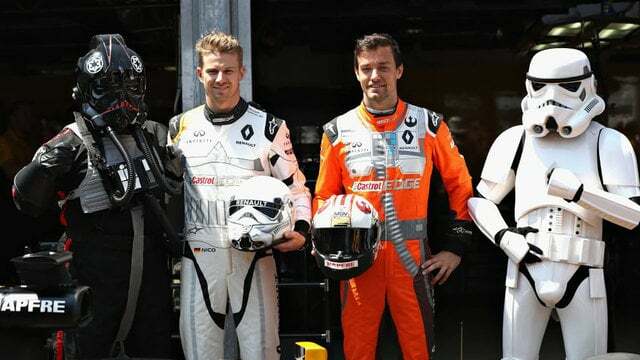 This is epic, Renault join forces with Star Wars to celebrate respective 40th anniversaries. Felipe Massa on how to manage Monaco: "Have a lot of patience in the race, and try to get to the end which is the most important thing. In Monaco, anything can happen." Sergio Pérez, on his aims for the race: "Try to get the perfect start, try to get a good position into turn one. Ninety percent of your race is how you get into turn one." Valtteri Bottas, on his chances from the second row of the grid: "We just need to be very reactive here. If we do a better job with the safety cars and stops, we have a chance to win." The FIA have confirmed that the risk of rain for this session is 0%. Looking at those blue skies, I'd have to agree. Before the national anthem, the drivers and officials respect a one minute silence. Tweet from @F1PaddockPass: Jenson Button will start from the pit lane - which may be beneficial. With Grosjean, Stroll, Palmer & Wehrlien all charging into T1? Yikes. About five minutes away from the start now, the tension is rising. it was a crowded and bustling grid, so probably a bit distracting for drivers. Looks like almost the entire field are starting on the purple ultrasofts. We've just got the Saubers of Wehrlein and Ericsson in 18th and 19th on the grid on the middle compound, the supersofts. The formation lap gets underway with Kimi Räikkönen pulling away from the grid to lead the field around a super short lap of Monte Carlo. Button has pulled to the end of the pit lane, and he's hearing radio live from Fernando Alonso, who wishes him luck and says "Take care of my car, have fun!" Good start, the grid clears well. Bottas had the smallest glimpse at second but Vettel was right there. Very, very clean start from everyone. Great job. Button has joined the rear of the field from the pit lane. He's off and away. Hamilton has passed Vandoorne already, he's up to twelfth now. The Ferrari pair are already pulling a gap at the front, Bottas is dropping back, there's a full second between him and the front two already. Wehrlein has pitted and put on the ultrasofts, ditching the red stripes already. Button has done the same but in the opposite direction, he's got the supersofts on now. Ferrari still putting the hammer down, fastest laps and purple sectors for Kimi Räikkönen in P1. Team radio from Jenson Button: "I had to lift in the pit lane, unsafe release?" That can only have been Wehrlein. Replays of the start show Hamilton's gain was off the line, and he and Vandoorne were side by side into the first corner but Lewis managed to stay ahead. Kevin Magnussen also gained places at the start, up two for the Haas so he's into the top ten. Incident involving Jenson Button and Pascal Wehrlein noted and then under investigation - unsafe release. Lewis is told that "our race comes later" which means Hamilton is going to have to be patient - arguably not one of his strongest characteristics. Never too early for some gap analysis. Esteban Ocon had a disappointing day yesterday, he crashed during FP3 and although the team did a fabulous job to get the car ready for qualifying, he didn't manage to make an impression. He's currently running 15th, just about a second behind Felipe Massa. Tweet from @Jamesallenonf1: In practice Raikkonen had the least tyre degradation on long runs of the front runners, so he's really in control here. His day? Räikkönen has pulled out a two second lead over his teammate - already there's talk of whether team orders will come into play later in the afternoon. Tweet from @PlayMotorsport: What a glorious sight these new cars are, gleaming in this beautiful Monaco sunshine. The lap count climbs quickly round this short track, and this first calm and patient stint is already 12 laps old. 5 second time penalty for Pascal Wehrlein - unsafe release. Vettel has closed the gap to 1.5 seconds to race leader Räikkönen now. They both have about six seconds over third place Bottas. Kvyat reports over the radio that the car in front is leaking oil, and yes, it's Nico Hülkenberg's Renault that is spewing smoke from the rear of the car. He's still going round for now. "Smoke out the back of my car," he reports. Gearbox problem, the engineers report. And he pulls off track just before the tunnel. Yellow flags, but that's a good position that Hülkenberg has found, so not likely to be a safety car yet. Sergio Pérez has come in, perhaps anticipating there might be one, but he needed a new front wing as well as new tyres. Replays show the front wing dragging along the floor so definitely a replacement required. Hamilton up to tenth now. Having just pitted, Pérez is now looking for a way past the Williams. We're rapidly heading towards the window for the one-stop strategy tyre switchover. Kimi Räikkönen continues to run strongly out front, and he's now closing up to start lapping the rear of the field. Button currently 1 minute 11 down. Team radio from Daniil Kvyat: "I have inconsistent engine braking somehow." Super-slo-mo replay shows Lance Stroll brushing up against the barriers, no closer please Lance! Hamilton reports his car is all over the place. Replays show a lot of wobbles from Ericsson, who complains very loudly on the radio that he has no grip. Button has been told to look for an opportunity during the blue flag period that is rapidly approaching. Räikkönen now on the rear wing of Button, as the gap between the Ferraris and Bottas is down to three seconds. Button moves out the way of the race leaders, and all three cars are through within a couple of corners. Replays show Max Verstappen missing the chicane at the swimming pool, continues on no damage done. Kvyat is still complaining about his engine braking, we're keeping an eye on him in case of incident any time soon. Team radio from Jenson Button: "This is painful." Aww, that didn't take long. Verstappen comes into the pit lane, given the instruction to do the opposite of Bottas. Red supersofts go on the Red Bull. Verstappen rejoins behind Sainz and ahead of Grosjean. Bottas is given the instruction to push hard now that Verstappen has pitted. Valtteri Bottas pits this lap, super clean stop from Mercedes. Bottas rejoins just in front of the Red Bull, so Mercedes have managed to hold that position ahead of Verstappen. Team radio from Kimi Räikkönen: "Are we boxing?" "Box this lap, Kimi, box this lap." Vettel stays out and inherits the lead for now. Team radio to Sergio Pérez: "Checo, engine temperatures are now critical. We have to do something different. If you can't chase and overtake, we have to drop back." "You box me because of safety, who cares if the engine blows up?" Räikkönen rejoined in third place, by the way. Vettel and Ricciardo out front still to stop, Daniel Ricciardo setting the fastest lap of the race so far. Tweet from @pirellisport: Good stop from #Kimi7: he’s done the two hard bits (start and pit stop) so now just has to drive to the finish. And hope. Marcus Ericsson was about to be lapped but he dives into the pit lane for his own pit stop, and to get out of the way. Good stop by the Sauber crew. Daniil Kvyat and Esteban Ocon have now taken their pit stops, dropping down the order. Vettel and Ricciardo trading fastest laps, as Bottas is stuck behind traffic. Sainz, after holding up Bottas, dives into the pit lane for his stop. Bottas is freed up but has probably lost out now. At some point, despite his complaining, Sergio Pérez did manage to get past Stroll. He's up to 14th, so you can see why he'd be a bit disappointed. Daniel Ricciardo comes in for his stop, and it's a clean stop for the team. Ricciardo has rejoined in front of Bottas, so he's gained a place. Now it's Vettel's turn to pit. Vettel rejoins in the lead! He's jumped teammate Räikkönen and moves in to P1. Team radio to Max Verstappen: "Ricciardo has, unfortunately, jumped us and Bottas." "What a **** *** disaster." Esteban Ocon gets the warning that he's got a rear left puncture. He makes it back into the pit lane for an unscheduled second stop. Purple ultrasofts back on the Force India. Grosjean pits from the midfield, and Button has come in for a second stop from the very rear of the field. Tweet from @pirellisport: As is often the case at #MonacoGP, traffic makes a big difference to strategy. In and out laps are crucial. Lewis Hamilton is up to sixth, having not yet stopped. Vandoorne is just behind him, also yet to stop. Jolyon Palmer is the only other driver not to have stopped yet, he's running 13th. Palmer comes into the pit lane, and Kevin Magnussen also dives in for a second and unexpected stop. Vandoorne takes his first stop of the day, rejoins the action in tenth place. Hamilton gets the call to box, box from sixth place. Another good stop by the pit crews, and Hamilton rejoins in seventh place, ahead of Grosjean. There's a ten second gap between the two Ferrari drivers now. If things stay as they are, which they very much might, Ferrari will overtake Mercedes in the championship standings. Team radio to Valtteri Bottas: "Possible raised manhole cover, exit turn one. There have been some punctures." Esteban Ocon is following closely behind Marcus Ericsson, but they're tussling for 16th and 17th place. Team radio to Jenson Button: "Track breaking up in the exit of turn one." Hamilton asks how his pace is and is told he's doing a good job, fastest man out on track at the moment. Tweet from @_markgallagher: "Amazing reliability & driver consistency today. 19 runners still. Tarmac breaking up at T1 around where resurfacing work was done y'day"
Replays show, at the exit of the tunnel, Pérez assumed Wehrlein had seen him and was letting him through to lap him, but the Sauber turned in. At the next corner, Sergio did get past and let his displeasure be seen with some wild gesticulations. A car is on its side, up against the wall at the entrance to the tunnel. The safety car has picked up the field, Max Verstappen has come into the pits for fresh tyres. Jenson Button has pulled off track in his McLaren, that's a retirement for the super-substitute. Radio from Wehrlein confirms he is okay, but perhaps is trapped in that car. Replays show Button just ran into the back of the Sauber, tipping Wehrlein into the barriers. Button carried on through the tunnel but then pulled off track at the side of the chicane. Team radio from Jenson Button: "Big damage, front right. Big damage. I'll pull off." Looks like he was trying an optimistic move on the Sauber, but it was never going to work. The car is now down and Wehrlein climbs out of the car. He looks okay, a bit shaken perhaps but walking comfortably. Felipe Massa comes into the pits, making the most of the opportunity under the safety car. Wehrlein climbs into the medical car and will be shuttled off to be checked out. He looks alright, phew. Team radio from Lance Stroll: "Losing a lot of grip, this is really bad. If I don't brake, I'm gonna have no temperature and I'm gonna crash as soon as we start... I don't know what to do, please help me." Marcus Ericsson has somehow managed to crash into the barriers whilst he was passing the safety car to unlap himself. The safety car pulled off track, but now we're waiting a little more for the second Sauber to be craned away. Button walks back to the paddock, he doesn't look too bothered. He got a lot further than I thought he was going to! Feels like a sluggish getaway from most. Bottas is heaping the pressure on Ricciardo, who tapped the wall at turn one. Yellow flags as Stoffel Vandoorne is in the wall. He did exactly the same thing as the Sauber, hitting the wall at turn one. Gutted for Vandoorne who was in the top ten and could have picked up McLaren's first point of the season. Ricciardo is really struggling with his tyres, Bottas is hunting him but Verstappen is not far behind - and Max is on fresh, softer tyres. Team radio to Kevin Magnussen: "You can push like an animal." You can see how tentative the cars have been on this restart, with lap times of 1:22, whereas before we were in the 1:15s. Turn 8 incident involving Jenson Button and Pascal Wehrlein will be investigated after the race. Team radio to Valtteri Bottas: "And if you're comfortable, strat 6." Replays show Sergio Pérez and Daniil Kvyat coming together, and debris scattering. Yellow flags as Daniil Kvyat has come to a halt out on track. Pérez had been complaining that he would crash because there was too much chatter on his radio. Oops. Pérez comes into the pits. Further replays show Pérez seeing an opportunity, but Kvyat quickly closed the door and the pair collided. Turn 18 incident involving Sergio Pérez and Daniil Kvyat will be investigated after the race. And Lance Stroll has pitted, the car being pushed into the Williams garage for another retirement. Tweet from @ForceIndiaF1: Contact between Checo and KVY! The Russian retires, puncture for Checo who stops and resumes the race in P13. Four laps to go, and Verstappen is hounding Bottas, who seems to have more pace and more control over his car at this very late stage. Only 13 cars left in the race. Hamilton is also on a charge, looking at the rear wing of Sainz's Toro Rosso in sixth place. The Force India/Williams battle didn't look like it was on this weekend, with all four cars out of the points earlier. But now Felipe Massa is up into ninth. Vettel has a nice comfortable lead out in front now. Sergio Pérez sets the fastest lap of the race - 1:14.820. Sebastian Vettel wins the Monaco Grand Prix! Kimi Räikkönen crosses the line in second place, with Daniel Ricciardo holding on to third place. Both Haas cars in the points, as well, a very good job for them. Tweet from @HaasF1Team: Chequered flag is out is out and it's a historic race for the @Haas_Automation team as both of our drivers earn points! Kimi Räikkönen congratulates his teammate, but doesn't look too happy to have missed out on the win. The drivers take to the podium, the trophies are handed out and there are plenty of cheers from the Ferrari team ahead of the national anthems. Not a great race to add to the list of classics, but another one that adds to the ever-intriguing storyline of 2017. Ferrari move into the lead of the championship but Hamilton has said there's still plenty to play for. Next post She'll be back!